Mummy-Tips: A laptop for under £10 - are you kidding? A laptop for under £10 - are you kidding? Number 1 son (now 18) has had a passion for Star Wars since he four years old. I believe that I have seen the original three moves over one hundred times each and could probably recite more of the dialogue than even I care to admit. Luckily for me DinoBoy has not taken on this passion, even with encouragement from the person that he loves most in the world. I am very happy about this as I don't think that I could stomach another fifteen years of it, especially as the new movies are pretty dire. 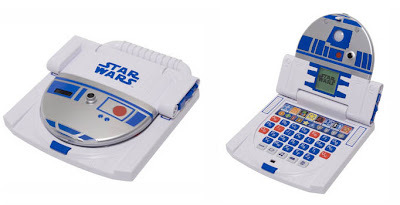 But when it comes to spending your £10 gift budget wisely - it really doesn't get any better than this Star Wars R2D2 Junior Laptop from Toys R Us. It comes in just under budget at £9.99 (reduced from £19.99) and it's packed full of features to keep your little one entertained for hours. It is personally a bit too noisy for me - but as it won't be taking up residence in my house who am I to care!! It runs off two AA batteries, which are included and features an easy to use ABC keyboard. It's a fun way to help children expand their vocabulary whilst developing logic and memory skills alongside a host of Star Wars characters. Suitable for children from 3 years. I suggest buying a few now and saving them for as and when you need them. At this fantastic price they won't hang around for long. Please take note that I do not appreciate noisy toys being given to my own children! I was tipped off about this fab product by Joanne at Parentdish - so thank you! That one is such a geek toy as well as child toy I bet loads of 'grown men' get them as they may become collectible! :) Great find!